Political battles have intensified in Guinea after the government thwarted an opposition rally to demand free parliamentary elections, raising fears that a return to stability and development after years of dictatorship and misrule could be in jeopardy. Security forces on 27 August surrounded a residence in the capital, Conakry, where opposition leaders had gathered, and blocked them from holding a planned march. Witnesses said the forces also threw tear gas canisters into the courtyard of another opposition leader earlier in the day. Interim government spokesman Damantang Camara said the authorities had stopped the march to avoid chaos. In response, opposition groups announced that they would pull out of government institutions, including the transitional parliament and the independent electoral commission. Their march was intended to call attention to the urgency of holding free and transparent legislative elections, which by law should have taken place within six months of the 2010 presidential poll. Opposition leaders accuse President Alpha Condé’s camp of planning to rig the legislative polls. “We cannot possibly cooperate with this government until we see some indication that it has the political will to respect the rule of law,” said Faya Millimouno, a member of the opposition movement who was among those blocked from holding the march. Arsène Gbaguidi, Guinea director of US-based National Democratic Institute (NDI), said blocking the opposition march was likely to deepen Guinea’s political problems at a time when the country can least afford it. “The events of 27 August could force both the government and the opposition to harden what are already rigid stances… This at a time when the authorities must face the tough development challenges of this country,” Gbaguidi told IRIN. President Condé himself was once a veteran opposition leader and is known for his decades-long fight for democracy in Guinea, which held its first democratic election in 2010, two years after a military junta seized power following the death of Lansana Conté, who had ruled the country for 24 years also after a military coup. “The sequestration of opposition leaders is humiliating and is a blow to Guinea’s image and to that of Alpha Condé, who worked for decades to bring democracy to Guinea,” said NDI’s Gbaguidi. Thierno Madjou Sow, the head of the Guinea Human Rights Organization and a long-time rights activist who worked with Condé in the past, said the current wrangling portrayed the difficulty of introducing democracy in a society where the leader has always ruled supreme. “We need a new vision of what is a `chief’,” he said, adding that citizens perpetuate the trend by failing to demand their rights. Guinea has also been plagued by ethnic conflict. Condé’s rival in the 2010 presidential elections, Cellou Dalein Diallo, is from the Peulh community, one of Guinea’s two main ethnic groups, while Condé is from the other large group, the Malinké. The president is seen as promoting Malinké at the expense of other groups. 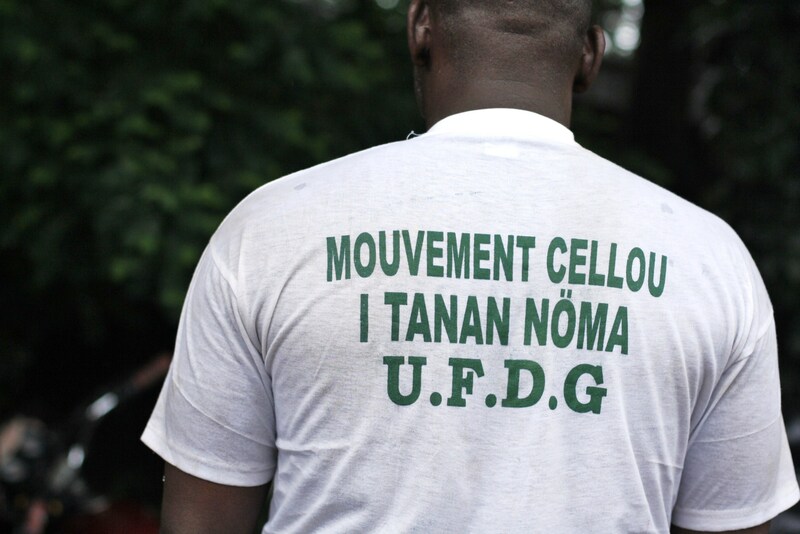 Diallo claims that eight of his supporters have been killed by security forces since Condé came to power and says the Peulh feel increasingly snubbed by Condé’s government. “Because of this frustration, among my supporters, moderates are becoming hardliners, and that’s very dangerous for Guinea,” Diallo told IRIN. A Conakry resident, who identified himself only as Eugene, said he is dismayed by what he calls “ethnocentrism” by Condé’s government. He cited a recent incident in which security forces allegedly killed villagers in Zoghota area in Guinea’s forest region. The incident followed an uprising by residents over a local mining company’s policies which they said sidelined locals in favour of Malinké workers. Opposition leaders and human rights activists say the killings are simply a continuation of the impunity that has reigned in Guinea for decades - a phenomenon, they say, they had hoped would end with the transition. Government spokesperson Camara said they have fervently condemned the incident in Zoghota and that the local leader had been sacked and an investigation was under way. The UN resident/humanitarian coordinator in Guinea, Anthony Ohemeng-Boamah, said reforming the police and the army was urgent. President Condé has been praised by the International Monetary Fund (IMF) for initiating economic reforms which have seen inflation fall to 15 percent in June (from 21 percent at the end of 2010), but many say they have not seen improvements in their lives. “This good performance is the result of strong efforts to restore budget discipline and avoid the need for bank-financing of the budget by keeping expenditures in line with available resources, supported by tight monetary policies of the central bank,” the IMF said in an 8 August statement. “We understand belt-tightening but the belt is ready to pop,” said Entraineur Kaba, a Conakry resident who preferred to be identified by his nickname. Guinea, which has the world’s largest reserves of bauxite - the raw material for aluminium - also has gold and diamonds, but its people remain among the poorest in the world. "Guinea has everything and Guineans have nothing" is a common refrain, said Perrussot, also a resident of the capital city. Conakry residents told IRIN it would be easier to tolerate belt-tightening if they saw more positive efforts from Condé’s government to avoid ethnic divisions, protect human rights and tackle impunity.